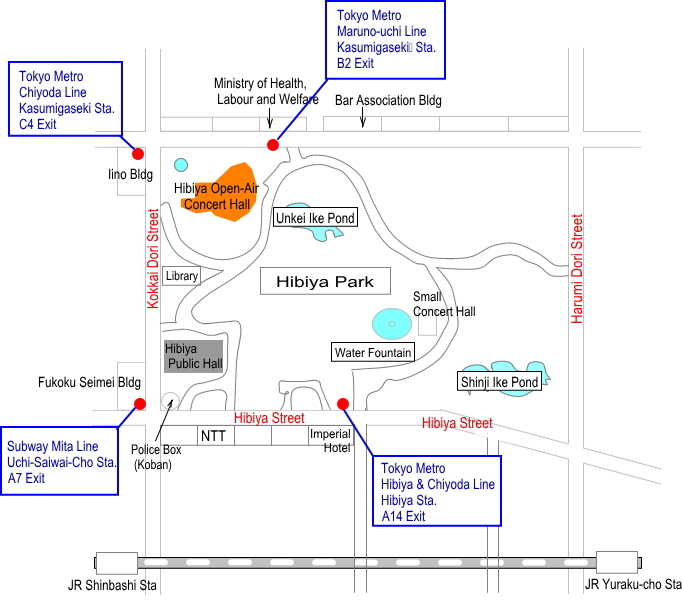 (Hibiya Open-Air Concert Hall) tomorrow so thought to make a map to get there. Since I am not familiar with that area, I used the map I found on the internet as reference. Seems there are 6 stations you can get off at depending on what line you are using. The orange area at the upper left in the map is where you want to go for the concert tomorrow. get off at “Kasumigaseki” station. 3 minutes walk from exit B2. get off at “Hibiya” station. 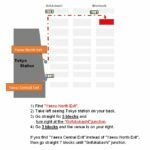 For “Hibiya” and “Chiyoda” line, you can choose the following 3) and 4) also. get off at “Uchi-Saiwai-Cho” station. 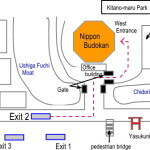 get off either at “Shinbashi” or “Yuraku-cho” station. 15 minutes walk from “Hibiya Guchi” exit. this site (Hyperdia) will probably be useful!! Check it out! it says to bring umbrella or rain coat. It will be outside hall so. OK! 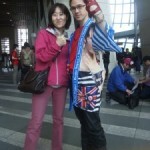 I hope you all aave a great time at the concert!! !